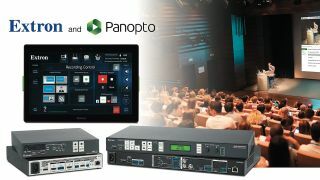 Extron and Panopto, an enterprise video platform provider, have formed a partnership to integrate Extron’s configurable AV control systems with Panopto’s media capture software and content management system. Extron is now publishing certified drivers for Panopto enterprise video content management systems. Extron’s configurable control will provide customers with customizable workflows to streamline day-to-day in-room tasks and simplify the capture and delivery of lectures and presentations. Additionally, in coming months, the Extron SMP–Streaming Media Processors will be directly integrated into Panopto, allowing the publishing of live and on-demand video content from the SMP products for both ad-hoc and scheduled recording applications. "Extron and Panopto share a belief that AV technologies should simplify how organizations communicate and share knowledge," said Sean Gorman, chief operating officer of Panopto. "With today's announcement, we're taking the next step toward that goal, bringing together Extron's room control hardware and expertise with the leading video platform for businesses and universities." The Extron-Panopto partnership will aim to provide a unified solution that encompasses AV control and media capture, coupled with enterprise video content management, delivery, and collaboration software services.